you deserve a grape today, veterans! Can’t think of anyone who deserves our thanks more than the people who fight for us to hang out in the US drinking wine. What to give them? Murphy-Goode’s Homefront Red, a blend of Syrah, Merlot, Petit Sirah, and Zinfandel. I just found out about this yesterday so I unfortunately haven’t tried the wine. I still wanted to do a post because it’s Veteran’s Day and because this is just a cool thing for a winery to do. For every $15 bottle sold, Murphy-Goode will donate 50 cents to Operation Homefront, a national nonprofit that provides emergency and financial assistance to the families of service members and wounded warriors. 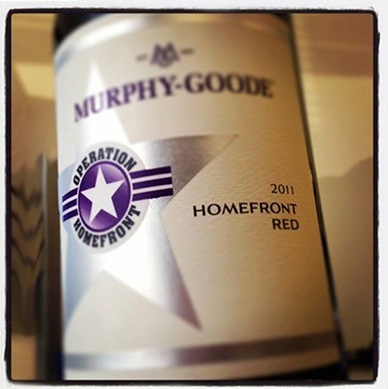 In the past two years, Murphy-Goode has reportedly donated more than $100,000 to Operation Homefront and is aiming for a whopping $300,000 total this year, partly through their Homefront Red wine. Liberty Creek Wine boost troops’ morale with country holiday music through the “Tunes for Troops” program. Liberty Creek will donate $1 per code to Operation Gratitude, up to $10,000, to include these CDs in the care packages Operation Gratitude sends to service members around the world. Tags: merlot, Petit Sirah, syrah, veteran's day, wine, zinfandel. Bookmark the permalink. Hubby is a veteran. He spent 22 years in the Army. I had no idea so many wineries supported our Military this way.That is awesome.